Airtable is best suited for any size company. Especially companies with many departments working on many projects. Airtable is also a great tool for regularly scheduled meetings to keep track of things discussed, documents used, and assignments. We use it to plan any event we hold for our company and our annual company retreat. It really keeps things organized and is very easy to access across any device. Outside of financial spreadsheets, this really replaces any spreadsheet software, including—and perhaps especially—cloud-based shared spreadsheets. Atlassian Confluence is well suited for a knowledge base, where an organization can post their important documents and allow for collaboration among colleagues. It is also very good for storing documentation and disseminating information. The platform might be less appropriate to store generic company documents or anything that is not proprietary. The website is very well laid out. It is uncluttered, easy to navigate, and is highly visual. There are a great range of field types and add-on blocks. Setting up bases is very straightforward. If you get stuck the help section and videos are excellent. You can also access Airtable Universe to see examples of how the product is used by others. I have submitted a number of queries by email and in each case the staff were very helpful and responded quickly. Given that I was using a free account at the time, I was very impressed. Given that I have used the product with very young children successfully, I think that it is extremely well designed. Confluence tries to provide a lot of team collaboration features under one cohesive product, and it succeeds in giving the user an integrated experience throughout its product(s). Confluence is highly configurable to suit different needs and processes a team may have for managing their work. Confluence has a developer API which offers even further customization and automation possibilities. A little more customisation of the forms would be fantastic. The interface is simple and helps avoid making problems for yourself, but being able to take out some of the white space and select different fonts or show basic formatting would be a good addition. But such is Airtable I am likely to find out with the right knowledge you can. Not being able to connect "Bases" together. This can be addressed by building all tables you need in to one base and remembering you can always export the data out somewhere else if you need this level of integration. If you are a larger or growing organisation, Airtables flexibility and ease at replacing spreadsheets needs to be managed (or you could replace your uncontrolled Excel addiction with an Airtable one). Confluence as a whole is very resource intensive and runs extremely slowly. This was the main reason our team abandoned it as our scrum tracking solution. The number of configuration options can cause the application to be confusing if you're wanting to tweak any of the defaults. The relationship between Kanban, backlog and sprint views could be particularly counter-intuitive. compared to other products it is just fabulous. I am confident that Atlassian can come with additional and innovative macros and functions to add value to Confluence. In 6 months, Atlassian transformed a good collaborative tools into a more comprehensive system that can help manage projects and processes, as well as "talk" with other Atlassian products like Jira. We are in fact learning more about Jira to evaluate a possible fit to complement our tool box. Just so easy to learn/use. Very intuitive in its application logic. I wish that confluence had some easily configurable fields for sorting and the organization of entries. It is always on, always ready. It is very adaptable and reliable. I have never seen any performance issue when it comes to page load time or that it slows down Jira. I have noticed that the edit within Confluence feature does not always work and you have to download and re-upload documentation as a new version. To be fair, this may be a localized issue. Sometimes, I have to wait a bit longer but I'm on a low priced option so I understand why. Generally, they're able to provide me solutions to my problems as long as I'm not in a rush. I have not had a lot of support experiences with Atlassian, but of the few I have, I wasn't very satisfied with the results. I found that multiple people would respond to the issue at various stages, requiring re-communication (even though the support system stores everything and shows it to both them and you). Often responses came at odd hours, resulting in 24+ hour turnaround on basic responses, even if you respond right away. Support often asks you to do things which require downtime, and don't seem sympathetic if your organization requires that downtime to be done off-hours. This makes it difficult to resolve issues in a timely manner, if at all.I must note that I have not opened a support incident with them in close to 2 years, and it's my understanding from colleagues that there has been much improvement. My comments and ratings reflect my older experiences. It wasn't until I became aware of Airtable that we found a solution that allows us to implement the best features of a collaborative RDBMS with our staff who don't have any training. I had previously used Zoho Creator and found that it was difficult to onboard new users because of a steeper learning curve. I am a smart sheet user but I utilize smart sheet for very different projects. I do believe smart sheet has much of the same functionality but I would use it in a very different way. Confluence has more of a web-based dialogue feel, where smart sheet is web-based but still has a very spreadsheet look and feel. This tool is very adaptable. So much so we use it for three completely separate projects, in three very different ways. 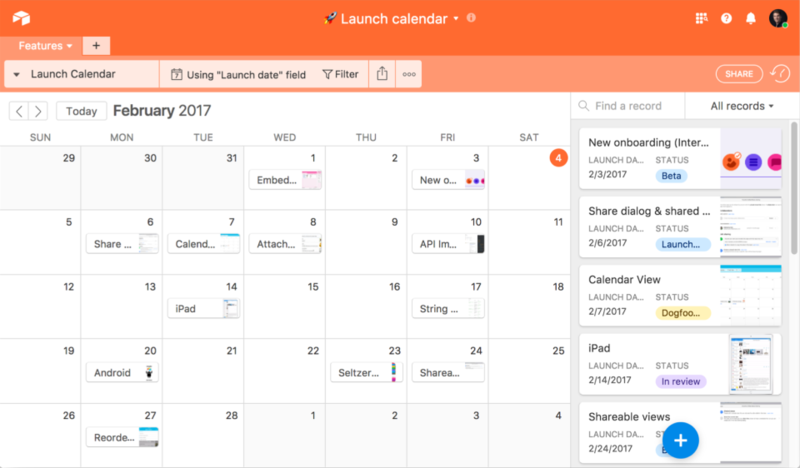 Airtable has made a positive impact on our organization by creating one app that allows us to do the vast majority of our work tracking and planning, in a fun and user friendly way. I previously used other task trackers and could not get employees to keep them up-to-date. Something about the visuals of airtable, the micro movements, etc... that my team loves! Shortening product development cycles through more efficient collaboration enables us to meet product launch at more competitive timing, which has proven essential to the business.